Ever fancied working for NSA, the UK organisation that provides a voice for the sheep sector? This could be your opportunity to drive what we do at a national and regional level. There are two roles on offer - a full-time employed role and a regional role paid on an honorarium. NSA is looking for a full-time Activities & Campaigns Officer, using NSA Head Office in Malvern, Worcestershire, as a base. 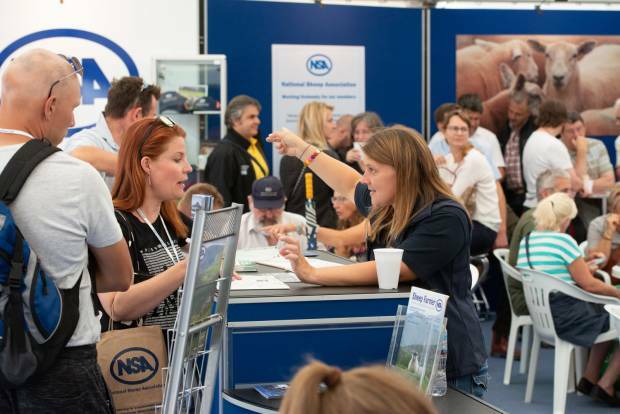 NSA is looking for an Activities & Campaigns Officer to develop, expand and organise activities, campaigns and initiatives to raise the profile of the association, directly leading to the recruitment of new members. This is an exciting and varied role where the right individual will be able to build on existing activities and design and deliver new ones, linking with NSA activity throughout the UK. The role will suit an enthusiastic, experienced, organised and creative individual. The ideal candidate will perform well on independent projects and work effectively with other NSA staff and office holders. They will be an outgoing personality with good communication skills suited to the agricultural sector. They must have a full driving licence and be willing/able to travel throughout the UK with the flexibility for some evening and occasional weekend work. Sales experience and/or knowledge of sheep farming is preferable but not essential. A fulll job description can be downloaded below. Salary in the region of £18-£22,000 depending on how much experience the candidate has, plus travel expenses and lieu time in line with the NSA policy. Applications close at end of play on Monday 7th January 2019. Interviews will be held on Wednesday 16th January. To apply, please download the full job description and application form below and send a completed application form, your CV and a covering letter to Joanne Briggs, NSA Operations Director, The Sheep Centre, Malvern, Worcestershire, WR13 6PH or [email protected]. To discuss the role or ask any questions, please email Joanne or call 07908 604744. NSA South East Region is looking for a Regional Secretary to organise and coordinate its presence in South East England. NSA South East Region is looking for a new Regional Secretary to organise and co-ordinate its presence in Buckinghamshire, Hampshire, Hertfordshire, Isle of Wight, Kent, Oxfordshire, Surry, Sussex and Wiltshire. This is an exciting opportunity within a small and friendly team of regional sheep farming committee members. It is a flexible role that will suit an enthusiastic and self-motivated individual. They will be involved in organising regional committee meetings and events and ensuring a close and effective working relationship between NSA South East Region and NSA Head Office in Malvern, Worcestershire. A full job description can be downloaded below. NSA South East Region will pay an honorarium of £1,800 per annum plus travelling expenses. Applications close at end of play on Monday 7th January 2019. Interviews will be held on Tuesday 15th January. To apply, please send your CV (complete with contact details for two referees) and a covering letter to Nigel Durnford, NSA South East Regional Chairman, c/o NSA, The Sheep Centre, Malvern, Worcestershire, WR13 6PH or email [email protected]. To discuss the role or ask any questions, please use the same email address or call NSA Head Office on 01684 892661 in the first instance. They will direct you to the appropriate person in NSA South East Region. Download the NSA Activities & Campaigns Officer job description and application form. Download the NSA South East Region Secretary job description.